Often I move things around, and get a new look. Sometimes that requires a purchase and sometimes it doesn’t. For this change at the farm, I bought a new rug, but the new ‘coffee table’ is re-purposed from another room. Here’s what the living room looked like last time. I love that little ottoman, but it looked too small for the space. I’ve moved it back to the city, but I still have it. The rug too has been moved to the city. 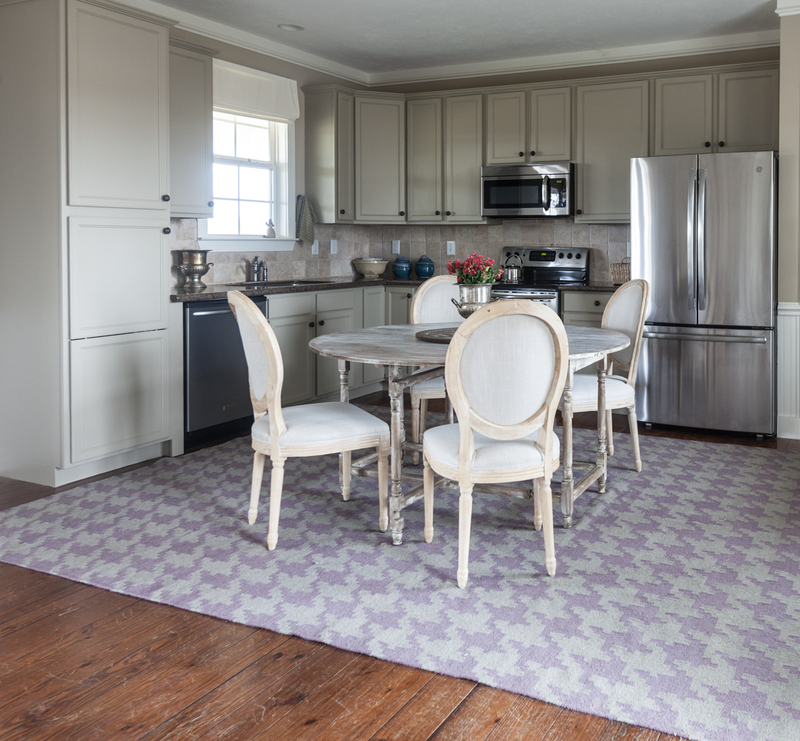 When I changed out the rug in the kitchen (which is open to the living room) I wondered if I should change out the living room rug to match the new kitchen rug. Here’s the new coffee table. It’s a super big wicker trunk I’ve had at the foot of various beds at different times. I like that it’s bigger and taller than the old ottoman. I think it’s sized better for the furniture here. And here’s the space with the new rug. Now it matches the rug on the other side of the room, and the rug is better because it is actually the correct size for the room. The old rug was really too small. My next project in here is to make slipcovers for the kitchen chairs. Are you de-cluttering this month? I’ve been taking some time off over the holidays, and then I spent a lot of time de-cluttering my home. I think I might share some of what I did in a future blog post. I wasn’t sure you wanted a blog post full of drawer organizers and folded clothes, but there does seem to be a lot of interest from our podcast. You’ll want to hear our episode about purging your home. Listen below. Love the changes in the living room. The “new” coffee table and rug really complete the space and I SO love that the living room rug is the same as the kitchen/dining. I have open living room/dining/kitchen in my small ranch home and am saving to get matching rugs. I really need some cohesion between my two rooms. My eye doesn’t like what it sees with two different rugs, even if one is mostly a solid color. Thanks for the inspiration. I think that is a great idea for an open concept room. 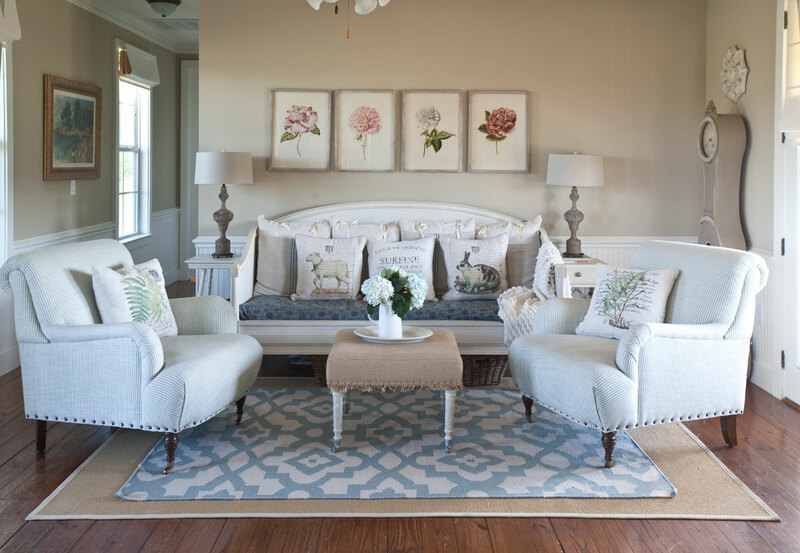 The rugs don’t have to be the same, but it does help to bring the room together if the rugs do match. I LOVE the change in ottomans! This one does fit the space, quite nicely. . .
and provides storage for pillow, throws, magazines, etc. The change in rug is amazing in the space! Always editing. . .season~by~season. . .especially in January. Pat, you are so right!!! We are short on storage, so I actually put some duvets in there!!! 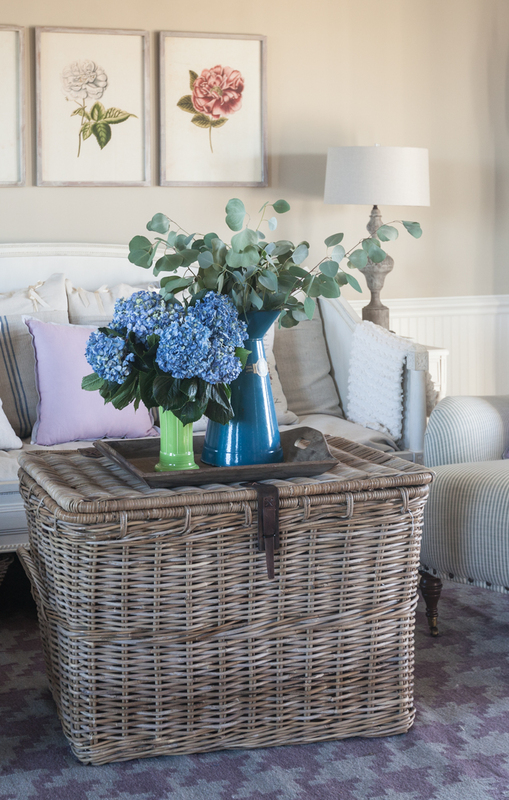 Ok, I really want to know where to find the wicker trunk! Is it available somewhere? Love how the room looks now ~ so cozy and inviting! Kathy, I bought it so long ago that I know it’s no longer available. Here’s an affiliate link to a trunk I found that is very similar. CLICK HERE. I definitely like the wicker trunk in there better, plus the color works well. Love the rug! I got a wild hair many years ago and painted my guest room a pale, pale lilac like that and it looked phenomenal! Then Hurricane Katrina destroyed my house and everything in it. Rebuilt, but now I’m living in my partners house and he’s got all this awful dark paneling that I’m slowly painting. 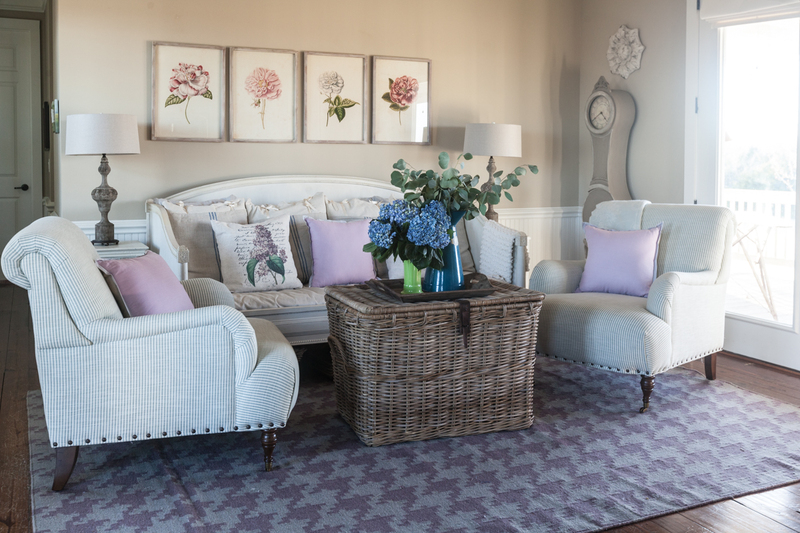 I may have to bring back that pale lilac after seeing how good it looks in your home! Thanks for the post, love your taste! Have a great rest of your week! Thanks Roxann!!! You are too kind.